Everyone who lives in London likes to take time away from this busy city, to have fun and enjoy the sun and fresh air. But for many refugee women in London there are invisible bonds that keep us bound to the city. The most difficult is the financial restraint: most of those who seek asylum live on support of less than £35 a week while their claim is considered and if you are a Londoner, you know this does not get you far. Many refugee women also live without immigration status for years, and this means they can’t leave the country. Perhaps the most invisible reason why refugee women can’t leave the city is that while your asylum claim is being considered you have to continually ‘go to sign’. This means you have to present yourself at the UK Visa & Immigration offices to show that you have not absconded; this may be every week, every two weeks or once a month. This spring Women for Refugee Women had an amazing opportunity given to us by the Landmark Trust. We were one of the 50forFree award winners, where we were given a holiday home for a few days in a remote part of Norfolk. 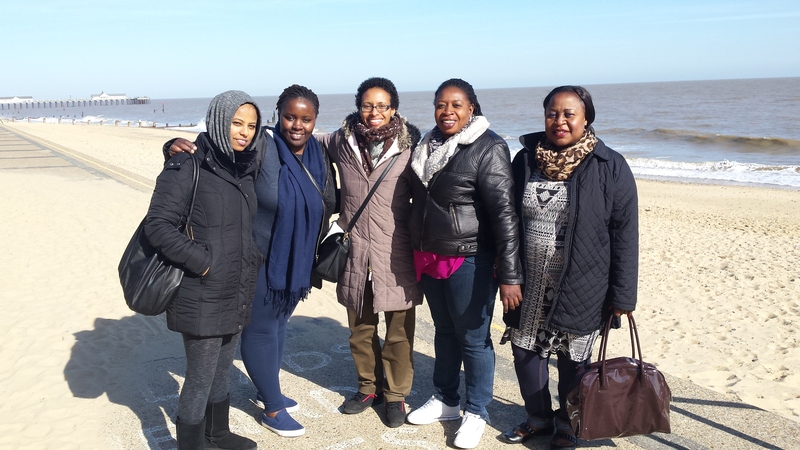 We were excited to take some members of the London Refugee Women’s Forum. Members of the London Refugee Women’s Forum have worked tirelessly to advocate for the rights of refugee women in the UK by speaking about their experiences to politicians, the media and at innumerable public events. In many cases the members of the Forum haven’t been on a holiday for years. Our holiday home was a beautiful Tudor house surrounded by green fields and only one neighbouring house. We were lucky, the English weather didn’t disappoint us, and we had clear blue skies and sunshine, although the wind was biting at times. There were six of us who went. We started off our lives in different countries: Cameroon, Kenya, Sudan, Gambia and Ethiopia, but we all shared the experiences of being a refugee woman in London, so there was so much to talk about at the dinner table. From the funny to the harrowing, all the experiences of being a refugee women were discussed openly and frankly and with a lot of laughter. Some of the topics included FGM, detention, Yarl’s Wood and racial abuse, others were about comparing foods and cultural differences. Our days were filled with outings to nearby cities and towns. We spent a day in Norwich city, visiting the cathedral and walking in ancient cobbled stone streets. We spent another day at Southwold, a small sea-side town, and walked up and down on the stunning beach. The woman from Gambia said “If it wasn’t so cold this would remind me of home”. We also met women who were inspired by the ‘Set Her Free’ campaign who lived nearby. One lady brought a welcoming gift of tea and cakes, while another was an excellent tour guide of Norwich city. We also had shiatsu massage provided to us by people who wanted to make our stay as relaxing as possible. It was wonderful to see the pleasure the women took in having this opportunity. One woman said as soon as she arrived, “I am going to make the most out of this holiday” and I think she did. One of the women kept pointing out that when she usually goes to bed, she sleeps listening to the sound of cars and sirens, but in the country side she was amazed how quiet it was. When we were making our journey back, all the women made me promise that we will do it again. So if there is anyone out there who has a holiday home for a group of refugee women to stay, please do contact us, so we can do the same for other women who are part of the group and who need it just as much. It’s an unforgettable and beautiful experience to stand in the English countryside and feel some of the anxieties and fears of seeking asylum drop away from you.